Washington Square in Ottawa, IL was the site of the first Lincoln-Douglas debate in 1858. There are lots of murals in the downtown area, including this one showing the debate. While we were out touring the Illinois and Michigan Canal, we stopped at Buffalo Rock SP to check out the view of the Illinois River. We also stopped off to see the Art in the Park at the Starved Rock Lodge. Forty pieces of Chain Saw Art are here. Wow, those bears must be really strong! But, by far, the best thing in the area was Starved Rock State Park. There are 18 canyons here formed by glacial meltwater and stream erosion in the 4-mile long sandstone bluffs. On one day we all went on a hike that included Wildcat Canyon. Phil and I went back another day and hiked to St. Louis Canyon. Did I mention I am easily distracted? And Kaskaskin Canyon. Wow! Don't miss this park if you are in the area. From Rock Island, we moved on to Ottawa, IL, where we stayed at Illini State Park. I had a lovely view from my site of the Illinois River, and one of the Locks and Dams on this river. 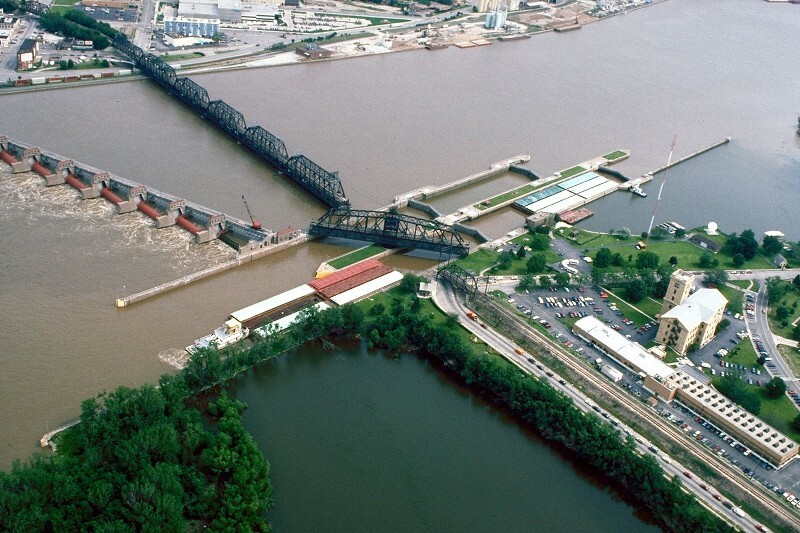 These locks and dams allow barges to go from Lake Michigan to the Mississippi River, where they can continue down to the Gulf of Mexico. The locks are just like the ones on the Mississippi River that we saw at our last stop. If the tow has more that 6 barges, it must disconnect and go through in 2 steps. The pelicans love to fish near the dam. This one was in the lock when the gate was closing, and freaked out. He made it out in time, although he could have just flown out the top. We also got to see how they fill the barges with grain. But before this lock and dam system was built in the 1930s, there was the smaller system of rivers, lakes and canals called the Illinois and Michigan Canal that served the same purpose. It was operated by manpower, with horses and mules towing the canal boats. The toll house is still standing. We happened to be there when it was open, and got a nice tour. Aqueducts were used in some places to provide a flow of water for the canal. They are now part of a bike path. Here the trees were growing around the wood that originally formed the aqueduct. From our base in Rock Island, we experienced lots of things in the Quad City area (Rock Island and Moline, IL and Davenport and Bettendorf, IA.) One of the first things we saw was the Isabel Bloom sculpture production studio. Although Isabel Bloom passed away in 2001, her sculptures are recreated by casting a mold and reproducing them in concrete. The larger ones are very popular in gardens. Under careful instructions that are on the wall. After the tour we went to Lagomarcino's Confectionary for lunch, and ended up with a tour there also! This is the Quad City Special, made to look like a Mississippi riverboat with a paddlewheel. We also went to the Black Hawk Nature Preserve. It was a tad too muddy to do much hiking, but we did wander down a nature trail by the river. But of course the big thing in Moline is the John Deere combine factory. The little guy is the S690 and retails for a paltry $547,000. It includes a GPS system that guides it through the field during harvesting. We also toured the Deere-Wiman house, built by John Deere's son in 1872. It served as home to four generations of Deere descendants. In 1976 it was donated for public use. We also visited the World Headquarters of Deere and Company. And went to the Deere Pavilion, where "kids" get to drive the Deere products on an animated system. I'm In the East Now! Yes, I crossed the Mississippi River! The Mississippi River has 29 locks and dams between Minneapolis and St Louis to keep the river at least 9 feet deep and navigable. Lock and Dam #15 is right here in Rock Island, IL, and we were lucky enough to get a private tour. The tow boats push as many as 15 barges up and down the river. When they go through the locks, they must push the first 9 barges in, unhook them, and the tow boat goes through with the other 6. Here the first 9 have already gone through. And the tow boat with the other 6 is entering the lock. Each barge carries the equivalent of 16 rail cars or 70 semi loads. So a 15-barge tow is equivalent to over 1000 semi loads! The barges can make it under the double-decker Government Bridge (trains on top, cars on bottom), but when the tow boat goes through, the bridge must swivel 90-degrees. You can see it swiveling in the first picture. The bridge was built back in 1896. It's possible to walk across the bridge. I was glad a train didn't go over while I was on the bridge. And you can even walk under the bridge, where you can see the swiveling mechanism. The dam here is the largest Roller Dam in the world. It is also known as "The Drowning Machine." The bridge has ropes hanging off of it that you can grab onto if you get too close to the dam. And if that wasn't enough excitement for the day, that evening we went to the Backwater Gamblers Water Ski Show. For some of their tricks, they just jumped off the dock in front of us. Some of the performers were pretty young. It takes a lot of power to pull all those people. There was a ramp that they could go over to do some of the tricks. It was an amazing show - highly recommended!